It’s often ignored that, in addition to long-drawn out crime serials, Louis Feuillade made a good part of his living off short, cheap kid films, such as the Bébé (Baby) films or the Bout de Zan movies (translated to English as “Tiny Tim”). Some years later, W.C. Fields would be praised for the wisdom of the saying “never work with children or animals,” but here Feuillade does both, with reasonable success. 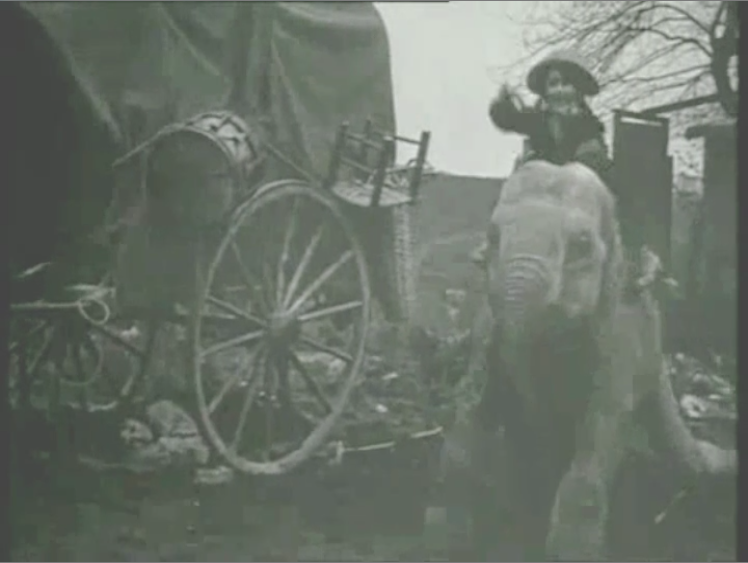 Bout de Zan is a tyke of maybe six or seven who wears a tramp outfit and sometimes looks at the camera when he should be “in the moment.” He sees a gypsy caravan with a young elephant (roughly adult-human-height), and coaxes it to give him a ride into the city. He scares some soldiers, takes over a beggar’s corner, and overturns an apple cart. Just when it seems the police will intervene, a kindly lady (Renée Carl again – just when I thought we might be done with her!) offers to take them to her house. The elephant demonstrates its excellent table manners by ringing the bell for the servant, eating with a fork, and using a napkin – but I hate to think how the maid will get the elephant poo off that lovely bourgeois apartment’s floors. Many of the “exteriors” in this movie were shot on a sound stage, indicating how low the budget was.